It is felt that certain skin psoriasis conditions may improve if not completely resolve after tonsillectomy. 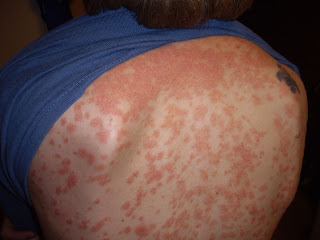 The psoriasis could be anywhere on the body and is hypothesized to be triggered by an abnormal immunological response to streptococcus, an organism commonly found in tonsillitis as well as strep throat. The exact mechanism is unclear but several studies performed over the years found potential benefit, especially for guttate psoriasis and even the more common plaque psoriasis. Tonsillectomy originally gained acceptance in Japan as a treatment for palmoplantar pustulosis, a condition that shares features with pustular psoriasis. Subsequently, tonsillectomy has been used for the treatment of plaque psoriasis and guttate psoriasis. Candidates are patients who report psoriasis exacerbation during or after a bout of tonsillitis, strep throat, or sore throat. Such treatment has been found beneficial in both kids and adults with psoriasis. Something to consider, especially if the psoriasis is resistant to standard dermatologic treatment. The role of tonsillectomy in psoriasis treatment. BMJ Case Rep. 2015 Jan 30;2015. pii: bcr2014206899. doi: 10.1136/bcr-2014-206899. Throat Infections are Associated with Exacerbation in a Substantial Proportion of Patients with Chronic Plaque Psoriasis. Acta Derm Venereol. 2016 Aug 23;96(6):788-91. doi: 10.2340/00015555-2408. Effect of tonsillectomy on psoriasis: a systematic review. J Am Acad Dermatol. 2015 Feb;72(2):261-75. doi: 10.1016/j.jaad.2014.10.013. Epub 2014 Nov 20. Tonsillectomy as a treatment for psoriasis: a review. J Dermatolog Treat. 2014 Dec;25(6):482-6. doi: 10.3109/09546634.2013.848258. Epub 2013 Nov 27. The role of the palatine tonsils in the pathogenesis and treatment of psoriasis. Br J Dermatol. 2013 Feb;168(2):237-42. doi: 10.1111/j.1365-2133.2012.11215.x. Epub 2012 Dec 13. Improvement of psoriasis after tonsillectomy is associated with a decrease in the frequency of circulating T cells that recognize streptococcal determinants and homologous skin determinants. J Immunol. 2012 May 15;188(10):5160-5. doi: 10.4049/jimmunol.1102834. Epub 2012 Apr 9. Treatment of psoriasis in children: is there a role for antibiotic therapy and tonsillectomy? Pediatr Dermatol. 2003 Jan-Feb;20(1):11-5.